The Division of Drinking Water (DDW), in collaboration with the California Department of Education, has taken the initiative to begin testing for lead in drinking water at all public K-12 schools. In early 2017, DDW and Local Primacy Agencies issued amendments to the domestic water supply permits of approximately 1,200 community water systems so that schools that are served by a public water system could request assistance from their public water system to conduct water sampling for lead and receive technical assistance if an elevated lead sample is found. To further safeguard water quality in California’s K-12 public schools, California Assembly Bill 746 published on October 12, 2017, effective January 1, 2018, requires community water system to test lead levels, by July 1, 2019, in drinking water at all California public, K-12 school sites that were constructed before January 1, 2010. This webpage contains information on both the permit amendments and AB 746. WHY ARE WE SAMPLING FOR LEAD IN SCHOOLS? 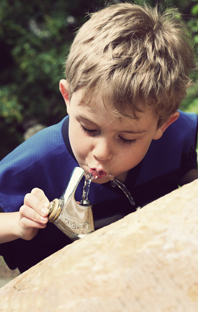 Recent events in the United States have shown that lead in drinking water remains an on-going public health concern, particularly for children. Lead rarely occurs naturally in California's drinking water sources, but may become present when water passes through older plumbing fixtures or solder containing lead that connects plumbing. Schools that are served by a public water system are not required to test their water for lead under the current Lead and Copper Rule. WHAT IS THE STATE DOING TO PROTECT CHILDREN FROM ELEVATED LEAD IN DRINKING WATER? In January 2017, the Division issued permit amendments to community public water systems serving K-12 schools requiring them to collect and analyze up to five water samples at each K-12 school that requests sampling. Once requested, the water system must then sample within 90 days. To provide direction, the Division has created many guidance documents as well as establishing a point of contact to answer questions relating to lead sampling in schools. The public water system and/or the State Water Resources Control Board may also provide technical assistance if an elevated lead sample site is found. Subsequent to the issuance of these permits, AB 746 was passed and signed by the Governor on October 13, 2017. The Bill goes into effect on January 1, 2018, requiring a community water system to test all public K-12 schools before July 1, 2019 based on specific criteria listed in	the Bill. WHAT IS THE CURRENT STATUS OF LEAD SAMPLING DRINKING WATER IN SCHOOLS? Public water systems that serve a public school(s) with building(s) constructed prior to January 1, 2010, must sample those sites by July 1, 2019. However, DDW encourages all schools to test for lead in their water supply, and may do so by requesting assistance from their water system, as a requirement of the 2017 Permit Amendment. If a school has already requested lead sampling from their community water system or has completed lead testing after January 1, 2009 and reported any results exceeding the 15 parts per billion action level to the public, then a school may not need to conduct further sampling for lead in the drinking water. For more information, please reference the FAQ documents under the Schools tab. If your jurisdiction does not have a local program, you may contact the California Department of Public Health, Childhood Lead Poisoning Prevention Branch, whose main webpage is: http://www.cdph.ca.gov/programs/CLPPB/Pages/default.aspx. Action Level Exceedance - The water system is to fill out and submit the Action Level Exceedance Spreadsheet as soon as they receive results of any exceedances in their system. Sampling Exemption Form - The Sampling Exemption Form is to be completed by either a water system or a school for any schools that do not have to be sampled under Assembly Bill 746. Download and submit the form using Adobe PDF. If you do not have outlook, gmail, or yahoo mail, email the electronically signed forms to DDW-PLU@waterboards.ca.gov. 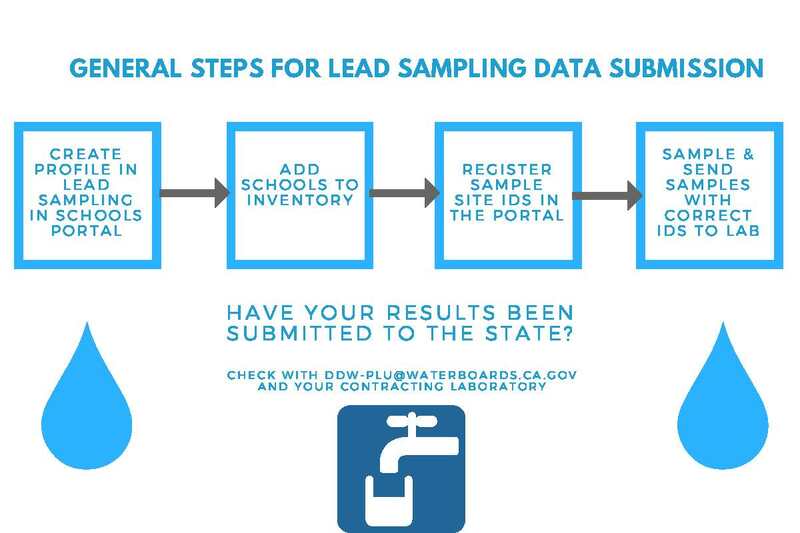 By July 1, 2017 you need to either a) add all schools you serve to your ‘My Schools Inventory’ using the link to the DRINC Lead in Schools tool above (no additional notification necessary), or b) email a spreadsheet to DDW-PLU@waterboards.ca.gov. The required fields are County, School District, School Name, School address, PWS name, and PWS number. The downloadable list of K-12 public and private schools at the California Department of Education websites http://www.cde.ca.gov/ds/si/ds/pubschls.asp and http://www.cde.ca.gov/ds/si/ps/index.asp might be a useful resource. The State Water Board, Division of Financial Assistance is establishing a new grant program to provide funds to improve access to, and the quality of, drinking water in public schools pursuant to Senate Bill 828. Information about the program will be made available on the webpage at http://www.waterboards.ca.gov/water_issues/programs/grants_loans/schools/. 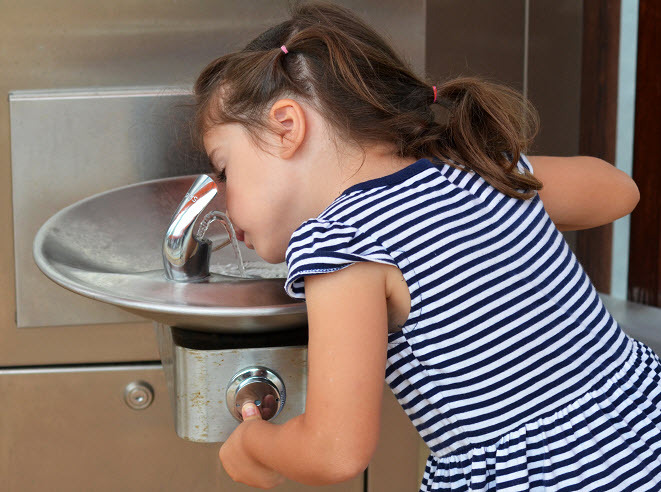 Sign up for the Drinking Water For Schools email list under FINANCIAL ASSISTANCE – (GRANTS & LOANS) to receive updates on this program as it is developed.